by Lesley Waters – it is a simple-to-whip-up apple cake that can be cut into bars or squares for a tea time treat - or anytime for that matter: breakfast, elevenses, lunch, picnic - just so yummy. You'll love food by Lesley Waters - go on, you know you want to. The reason I have chosen the Dorset Apple Tray Bake is because on Saturday, 7th May 2011 in Authuille on the Somme, a WW1 memorial was placed and dedicated; that of the Dorset Regiment. Until then there had been no Memorial for The Dorsets and The Dorset Memorial Project raised £23,000 and worked tirelessly to remedy this. The site chosen for the memorial is on the Somme battlefield where, during the summer and autumn of 1916, two of the three Dorset Regiment battalions fighting on the Western Front, (the third was only a few miles away), fought in epic and costly engagements during the Battle of the Somme. 350 died on that dreadful first day: 1st July 1916. On one side of the column is the Dorset Regiment badge and on the reverse are the County arms of Dorset. Around the base are carved the Dorset Regiment First World War battle honours that are shown on the Regimental Colour, and an appropriate quotation from Thomas Hardy: "Victory crowns the just.". The result is stunning. It commemorates the 4,500 men of The Dorsetshire Regiment who died in the Great World War. The Memorial is located in a particularly good spot on a site that will receive many visitors who pass on their way to Thiepval plus those visiting the Lonsdale Cemetery and Leipzig Salient. 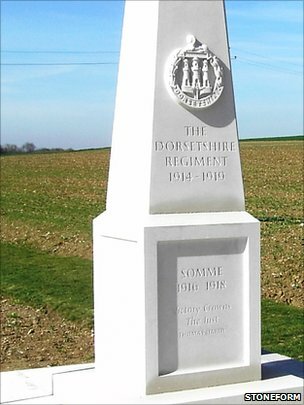 It was carved by sculptors Zoe Cull and Alex Evans at their workshop at Bockhampton, near Dorchester and was dedicated in the village of Authuille on the Somme, on Saturday 7th May 2011 at 1100 hrs.